Do you know why it's called Barometric Pressure? Air pressure is also called barometric pressure because barometers are used to measure it. The weight of the air pressing down on the Earth, the ocean and on the air below causes air pressure. Earth's gravity, of course, causes the downward force that we know as "weight." Since the pressure depends upon the amount of air above the point where you're measuring the pressure, the pressure decreases as you go higher. Air pressure is related to its density, which is related to the air's temperature and height above the Earth's surface. Air pressure changes with the weather. In fact, it's one of the most important factors that determines what the weather is like! Bet you didn't know air could be so important! Atmospheric pressure at the Earth's surface is one of the keys to weather, which is one reason weather maps feature H's and L's, representing areas of high and low air pressure. High and low are pressure are important because they affect the weather. The weather maps, such as those on television, show what's happening at the Earth's surface, and that's what we're talking about here. As the name says, a "high" is an area where they air's pressure is higher than the pressure of the surrounding air. A "low' is where it's lower. Meteorologists don't have any particular number that divides high from low pressure; it's the relative differences that count. The pressure is high at the surface where air is slowly descending - much too slowly to feel. And, this is going on over a large area, maybe a few hundred square miles. As air descends, it warms, which inhibits the formation of clouds. This is why high pressure is generally - but not quite always - associated with good weather. The air that descends in high pressure areas, has to get to high altitudes in some way, and that way is by rising in areas where the pressure at the surface is low. As air rises it cools. As the air cools, the humidity in it begins to condense into tiny drops of water, or if it's cold enough, into tiny ice crystals. If there is enough water, or ice, rain or snow begin to fall. This is why low pressure is associated with bad weather. 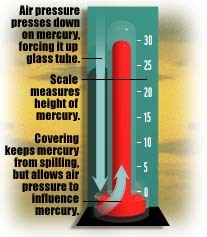 Here's a great image of a barometer and how it works.